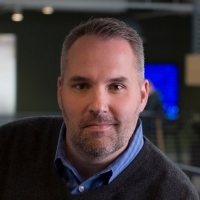 Scott Van Vliet joined Microsoft in January 2018 and serves as Corporate Vice President, Intelligent Communications. In this role, Scott leads a group of talented folks who create the common infrastructure and platform that enable real-time communication across Microsoft's product including Skype, Skype for Business, Microsoft Teams, and other messaging products across the company. He has a passion for developing leaders and scaling teams to achieve their maximum potential. Above all, Scott is an unabashed optimist. He's spent the last 20 years building products that customers love, taking big risks to create new and innovative types of consumer products. Prior to joining Microsoft, Scott led multiple product and technology teams at Amazon, running the remote development center in Orange County, California. Most recently, Scott led multiple teams who created new Amazon Echo devices and new experiences with Amazon Alexa, having created the initial platform that enabled "Skills" and the cloud capabilities for the Alexa Voice Service. Scott also led Amazon's Appstore team, enabling the third-party platform for over-the-top (OTT) services on Fire TV and other innovative concepts for digital goods. Scott doesn't take himself too seriously and believes that having fun and embracing your inner child can often lead to creative solutions for customers. He further developed those ideals while at Mattel, where he served as Chief Technology Officer and Vice President, Digital Play, creating new ways to play by juxtaposing physical toys with digital experiences. Previously, Scott held various positions in technology consulting for the Media & Entertainment industry, including his role as Principal at Capgemini. Scott and his wife, Sebrina, recently relocated to the Seattle area from Orange County, California with their six children – Chloe, Aidan, Gabriella, Layla, Gemma, and Liam. In his spare time, Scott enjoys spending time with his kids swimming, doing arts & crafts, and playing tons of games. He's also passionate about philanthropy and serves as an advisor to the Jessie Rees Foundation, who's charter is to encourage courageous kids fighting cancer around the world to Never Ever Give up (NEGU).